On behalf of concerned Idaho and Washington citizens, potentially impacted human and non-human residents along the proposed Mammoet USA South, Inc. (Mammoet) transportation corridor, members and allies of Wild Idaho Rising Tide, Spokane Rising Tide, Kootenai Environmental Alliance, Friends of the Clearwater, and Palouse Environmental Sustainability Coalition, and air, water, and soil quality, we the undersigned submit for the public record the enclosed and attached comments about the Coeur d’Alene Lake Drive temporary overweight truck route and ramp (“project”) currently under review by the Idaho Transportation Department (ITD) and the Federal Highway Administration (FHWA), per National Environmental Policy Act (NEPA) requirements. According to ITD documents, we understand that Mammoet has requested ITD permits to haul three overweight equipment shipments (“megaloads”) three to four weeks apart, starting in February 2014, from the Port of Wilma, Washington, to Great Falls, Montana . To nominally minimize the disruption of rolling, night-time, route closures guided, if not guarded, by pilot and perhaps police vehicles, Mammoet’s latest 1.6-million-pound, 472-foot-long, 27-foot-wide, 16-foot-tall behemoths would again travel U.S. Highway 95 north to Interstate 90 (I-90), then move east through Coeur d’Alene on the interstate to the Sherman Avenue exit. Averting undue stress to the Veterans Memorial Centennial Bridge, the transports would alternatively drive 5.5 miles along East Coeur d’Alene Lake Drive for approximately one hour, pass under the currently blocked I-90 overpass near Higgens Point, and re-enter Interstate 90 in the wrong direction, along a temporary on-ramp proposed for construction on the north side of the interstate. Public records explain that this project would entail no construction along Coeur d’Alene Lake Drive or publicly accessible roadways, and that it would temporarily close I-90 for about ten minutes and remove six interstate concrete barriers on both sides of the westbound lanes, to facilitate access to the eastbound lanes after transport entry onto westbound lanes. Apparently, ramp creation would necessitate “minor” grading of a 300-foot by 100-foot area north of Higgens Point and the interstate. Surfacing this ramp with only gravel would bear the heaviest load ever attempted on this cross-Idaho route. Because we the undersigned have been opposing transportation of tar sands and fossil fuel infrastructure components throughout the Northwest/Northern Rockies region since May 2010, we have directly experienced many of the detriments to our public resources and rights that these pursuits, especially by Mammoet, engender. Our state transportation department and responsible elected and appointed officials have not been responsive to our concerns about these transports. We are therefore co-writing and addressing this letter of concern to government agencies and representatives who may better consider and act to prevent the implications of this proposed Mammoet move and on-ramp construction for air and water quality, wildlife and habitats, the regional environment and inhabitants, and global climate. Besides FHWA and ITD personnel in Boise, Coeur d’Alene, and Lewiston, Idaho, we the undersigned are sending this statement to Idaho Governor Otter, Kootenai and Latah county commissioners, the mayor and city councilors of Coeur d’Alene and Moscow, the Idaho departments of Environmental Quality and Fish and Game, the U.S. Environmental Protection Agency (EPA), the U.S. Fish and Wildlife Service, the U.S. departments of the Interior and Transportation, and two attorneys well-versed in transportation and megaload issues. Some of these agencies and citizens have advised against other highway expansion projects proposed by ITD, due to likely environmental impacts. We urgently encourage their response while Mammoet’s and ITD’s proposal package remains under review. Construction and use of the Coeur d’Alene Lake Drive temporary overweight truck route would have significant impacts on the environment, which would directly challenge our interests, both as organizations and as American, Idaho, and Washington citizens, including but not restricted to the following impacts. Perhaps the most sensitive issues among these concerns are the purpose, construction, and continued use of the supposedly “temporary” on-ramp that would provide access for Mammoet to the westbound lanes of Interstate 90 from Coeur d’Alene Lake Drive. In their Notice of Public Meeting: East Coeur d’Alene Lake Drive Temporary Overweight Truck Route, Kootenai County, Idaho, printed in the December 13, 2013, Coeur d’Alene Press legal section, ITD and Mammoet suggest that this proposed, 300-foot-long and 100-foot-wide, “new, temporary on-ramp will be constructed on public right-of-way north of I-90,” and that “upon completion of transport of the three loads, the temporary access ramp will be abandoned” . Because the responsible agencies assume that no overlegal, oversize, or regular traffic would further utilize this access ramp, FHWA and ITD are likely following the NEPA protocol of a categorical exclusion for this project. But several circumstances indicate that this temporary Interstate 90 on-ramp could see ongoing and increasing passage of grossly overweight transports. In the summer of 2009, ITD, with meager funds and management of some of the most dilapidated road and bridge infrastructure in the Northwest, inexplicably widened much of U.S. Highway 12, paved and added curbs to eleven gravel turnouts, and trimmed roadside trees. ExxonMobil subsidiary Imperial Oil stealthily spent $3.4 million improving another nine turnouts and moving private utility lines . That autumn, resident rumors began circulating that huge transports would soon invade the largest contiguous complex of roadless and wilderness areas and wild and scenic rivers in the lower 48 states. Although five court cases in two states ultimately deterred most Imperial Oil use of Highway 12, its investment of re-construction costs and the unobstructed nature of the sparsely populated, overpass-free highway have attracted and/or accommodated a steady stream of other heavy equipment movers since mid-2011, as evidenced by media accounts and ITD public records obtained by various concerned citizen groups. A persistent and insolent heavy haul corporation currently blocked from Highway 12 transit by a federal preliminary injunction, Omega Morgan has recently dragged two of three pieces of in-situ tar sands mining evaporators over most of a 1200-mile course circumventing Highway 12 via eastern Oregon, southern Idaho, and western Montana. When Wild Idaho Rising Tide (WIRT) asked its presenter, Eric Zander, at a recorded November 18, 2013, public meeting in John Day, Oregon, why his company did not carry these 900,000-pound loads up Highway 95 and Interstate 90, like the stranded, dismantled evaporator it transported in five parts along this route in October and November 2013, he replied that height and weight restrictions prevented a similar itinerary. As the new route averting Nez Perce and allied resistance on Highway 12 proves too logistically difficult and expensive, emerging lawsuits in Oregon and Montana could also challenge or obstruct portions of this alternative overlegal vehicle path. With megaload sizes increasing, Interstate 90 bridges cannot fit their height but most critically cannot bear their weight. Together, these circumstances necessarily target the East Coeur d’Alene Lake Drive bypass of I-90 bridges and allude to the probable permanent use of the Higgens Point “temporary” on-ramp as the crucial conduit for Pacific Rim-manufactured megaloads moving from West Coast ports to inland refineries, the booming Bakken shale oil fields, and the 80 percent of Alberta tar sands deposits too deep to surface-mine, requiring waste fluid evaporators and other colossal equipment for fracking-like extraction operations. Because neither ITD nor Mammoet have declared that they intend to remove – only “abandon” – this temporary Interstate 90 on-ramp after movement of the three proposed loads, its construction creates an alluring incentive for repeated use of the proposed route and ramp. Pertinent regulatory agencies can anticipate aggressive corporate insistence on further maximization of these public resources. With ITD predictably obliging by issuing megaload permits that increasingly facilitate the emergence of a regional “high and wide” industrial corridor, construction of the on-ramp near Higgens Point would lead to significant impacts to the land use, planned growth, and environment of not just the immediate and connected area and entities as herein described, but of entire megaload routes – from their origins at ports in the Lewiston, Idaho, and Puget Sound, Tri-Cities, and Vancouver, Washington, areas, to their various destinations in Canada and the United States. Thus, the Federal Highway Administration and Idaho Transportation Department should consider all of the significant impacts of the entire, proposed Mammoet haul and future transportation projects that the “temporary” ramp makes possible. Such analysis is compulsory – and more conclusively conducted with a NEPA environmental assessment or environmental impact statement, rather than a categorical exclusion – because the on-ramp in question holds no independent utility beyond its use as a megaload access point, most notably because it enters I-90 in the wrong direction. In the almost 24 years since construction of the interstate interchange at Higgens Point spectacularly failed, no road structures have similarly been built there for other purposes. But without this on-ramp establishment, Mammoet – and likely other heavy haulers – could not travel the Interstate 90 route with cargo that exceeds its bridge capacities. Federal guidelines mandate that all highway construction, enhancement, or expansion projects minimize environmental impacts, while most fully utilizing existing roadway footprints. The Higgens Point temporary on-ramp proposed by Mammoet and ITD do neither. As explained in the following comment sections, the construction and use of this megaload route could unleash a plethora of significant environmental, social, and economic impacts within the project area, along the proposed and other connected, proven, overlegal shipment corridors, and at the origins and destinations of the transportation projects facilitated by this essential on-ramp component. Moreover, the project minimizes the full potential of the current roadway infrastructure by building an interstate access point purportedly only utilized by one heavy haul company on three occasions, without any further benefit to the public who unknowingly and unwillingly subsidizes Mammoet’s and ITD’s gamble with the significant impacts detailed herein. This project, including its construction and overlegal load use of the “temporary” on-ramp, could result in significant impacts on the water quality of Coeur d’Alene Lake and surrounding surface and subsurface flows [4, 5]. The soil and slope stability of the land in the Higgens Point area where Mammoet intends to build this ramp has proven unreliable twice in the past, notably during similar Interstate 90 establishment and improvement projects . These unstable conditions, whether products of the high soil content of the substrate surrounding the interchange, the deep muck overlying the nearby lakebed, or previous, questionable, earth-moving projects, would be most vulnerable to collapse under heavy machinery during the periods of ground saturation from late winter snow-melt and the highest precipitation of the year in spring. Although project planners assert that no wetland impacts could arise where the ramp would be built, the concave ground surface of the project area is obviously wet enough to require an existing storm drain pond and a proposed culvert and temporary fill ditch. Recent observers have noted patches of snow and standing water throughout the targeted on-ramp site. Regardless of the barrier of interstate structures between the majority of the planned construction zone and the lake, run-off and sediment displaced during on-ramp creation and megaload passage could inadvertently – or purposely, through the proposed culvert under the interstate – flow into the lake. Moreover, Interstate 90 traverses the steep hillside at least a few hundred vertical feet above the traffic-blocked end of Coeur d’Alene Lake Drive and the lakeshore that parallels the proposed megaload route very closely throughout its course from the city to this underpass/on-ramp location . Such water body proximity could prove disastrous in the event of common megaload tip-overs in transit, like the at least three incidents that occurred within 500 miles over the last year . Accommodating 16-foot-tall, 1.6-million-pound transports by excavating height clearances under the interstate bridge at Higgens Point, constructing a purportedly short-term ramp with a minimum, weight-challenging grade on gravel, and moving 27-foot-wide, 472-foot-long megaloads over a short, angular distance to the wrong side of Interstate 90 appear both impractical and unreasonable, due to the necessary but obviously overlooked enormity of the project, provoked by the scale of the loads. Higgens Point is both an environmental treasure for the area and the site of an infamous environmental failure for ITD. In the early 1990s, ITD was attempting to build an interchange there, when a huge landslide sent two pieces of heavy earth-moving equipment and tons of gravel into the lake, right where kokanee spawn. As part of its penalties, to mitigate the damage, ITD expanded spawning beds all along the area and built the popular Centennial Trail. Plus, federal authorities nixed the interchange the agency had been attempting to build, to connect the former freeway at Lake Coeur d’Alene Drive with the new one on the far side of the then-new high bridge. That’s why it’s now a popular recreation and wildlife viewing area with no through traffic. The partly completed remains of that abandoned interchange are what will serve as the temporary on-ramp . All of these circumstances forebode the strong possibility of road structure collapse and catastrophic slope failure beneath Mammoet’s excessively heavy megaloads on this proposed route, which could inflict subsequently significant impacts on water quality throughout a vast watershed . This accident could happen while the transport is moving along Coeur d’Alene Lake Drive or during its passage uphill, under, and entering Interstate 90 in the wrong direction just before Higgens Point. It could occur while megaloads cross the 1319-foot-long Blue Creek Bay Bridge built in 1951 or during their daytime layovers in the large parking lot at the end of Coeur d’Alene Lake Drive, as mentioned by Warren ‘Chip’ Kachel at a January 15, 2014, Moscow, Idaho, public meeting [11-13]. This layover spot rests on unstable fill at the edge of the lake, disconnected from the higher, contoured, steep hillside above the interstate. Such a massive load of equipment falling into Coeur d’Alene Lake could significantly disturb and displace some of the millions of tons of toxic, heavy-metal mining waste deposited in the lake sediment by the Coeur d’Alene River, flowing from mountainous Silver Valley extraction sites since the late 1880s . Placed on the national priorities list in 1983, the Bunker Hill mining and metallurgical complex in the Coeur d’Alene Basin, including the lake, constitutes one of the largest areas of historic mining operations in the world and consequently the second largest Superfund site in the nation. Mining, milling, and smelting activities have discharged into the basin’s air, surface water, soil, and groundwater contaminants such as antimony, arsenic, cadmium, copper, mercury, zinc, and especially lead, which significantly endanger human and environmental health. Approximately 70 million metric tons of toxic heavy metals lace the bottom of Coeur d’Alene Lake. Because resource managers and environmental regulators cannot realistically remove the thousands of submerged acres of polluted, heavy metals-laden, lake sediments, they and the public must minimize lake-bottom disturbance and sediment release into the overlying water. Disassembly and removal of a risky, heavy megaload that has tumbled into Coeur d’Alene Lake would jettison a hazardous, chemically-interactive plume of poison sediment that could significantly impact the water quality of nearby and downstream aquatic life, waterfowl and wildlife, wetlands and rivers, the Coeur d’Alene and Spokane Tribes, communities in two states, and hundreds of thousands of people in the vicinity . Road compaction and deterioration from transports weighing 1.6 million pounds, erosion of surrounding surfaces and underlying roadbeds, and run-off from ramp construction activities before, and road maintenance during, megaload movements could increase sedimentation and turbidity and decrease oxygenation in Coeur d’Alene Lake, which lies only short distances from the proposed Coeur d’Alene Lake Drive route of Mammoet’s overlegal loads. Accumulated sediment over the eggs of kokanee salmon, Chinook salmon, bull trout, and other federally protected endangered species and aquatic life in Coeur d’Alene Lake suffocates and/or compromises their development and eventual hatching that contributes to natural maintenance of viable populations of these fish and other species in the lake and surrounding basin . Diminishment of these species would additionally significantly impact resident and visiting mammals and birds – such as osprey, bald eagles, bears, and other wildlife – dependent on or benefitting from these food resources. Every year during the winter months of November through February, coinciding with the timing of proposed megaload movement and on-ramp construction, migrating bald eagle populations feed from the shoreline trees on spawning and dead kokanee salmon in Coeur d’Alene Lake. Besides this annual occurrence in the Higgens Point vicinity, emblematic of the renown natural beauty of Coeur d’Alene Lake, the project area encompasses other important habitats and values for wildlife and recreation, which could be significantly impacted by the interference and disturbance imposed by this megaload route and on-ramp. Year-round wildlife and landscape observers, photographers, bikers, runners, skaters, skiers, walkers, and other recreational users enjoy the Centennial Trail, located between Coeur d’Alene Lake Drive and the lake shoreline. These locals and guests of the Coeur d’Alene community consider the project area “one of the most precious parts of this community” . Their associated recreation and tourism provide sustainable and growing sources of revenue upon which the regional economy depends. Owners of businesses, homes, and land in the megaload route and ramp area have publicly expressed concerns that, if gargantuan transports frequent this emerging, permanent, industrial supply route, traffic patterns and development on the lake may drastically and harmfully change . They wonder about the aftermath and implications of megaload accidents and extended blockage of citizen and emergency vehicle access to Interstate 90 traffic lanes and exits and the numerous homes between the lake and Coeur d’Alene Lake Drive. They raise concerns about these huge transports crowding the narrow shoulders, damaging the road surface, colliding with roadside houses, or falling into the lake from Coeur d’Alene Lake Drive, without Mammoet contingency plans and bonds. They ask about the cost/benefit analyses and types, durations, and hiring processes of regional jobs generated by this project. And they understand that proposed Interstate 90 ramp construction and overlegal shipment travel on this lakeside route probably represents more than a one-time situation, with ongoing megaload traffic significantly, negatively impacting all of these dynamics as well as Coeur d’Alene Lake Drive real estate values, home insurance, and megaload-induced road repairs covered by taxpayers. Although Coeur d’Alene Lake Drive has never accommodated extra-heavy loads, only light residential traffic since interstate completion decades ago, ongoing road deterioration without appropriate repair has been documented around Bennett Bay. The dimensions and weight of the proposed project transports would surely result in significant degradation and subsequent erosion of Coeur d’Alene Lake Drive. Between April 11, 2011, and March 6, 2012, Mammoet hauled over 70 transports weighing up to 500,000 pounds on U.S. Highways 12 and 95 and Interstate 90 through northern Idaho, between the Port of Lewiston and Lolo or Lookout Pass and into western Montana. Until June 2012, it transported another 280 modules across Washington, Idaho, and Montana, from Interstates 5 and 405 or U.S. Highway 395 onto Interstates 90 and 15. All of these 350 megaloads passed through the Coeur d’Alene project area. Expensively and dangerously facilitated by the Idaho Transportation Department, state police, and private contractors, Mammoet’s Imperial Oil shipments imperiled the safety and schedules of travelers, while delaying, confusing, and blocking public highway access and traffic with their 16- to 24-foot, two-lane widths and lengthy, glaring cargoes and convoys. Transport operations caused personal injury and property damage through numerous accidents and collisions with vehicles, tree branches, and power lines, as they degraded highways with washboard ruts in lane centers, and pummeled saturated road beds, crumbling shoulders, and outdated bridges [17-20]. Concurrent, colossal, transportation ventures through the region, imposed by other haulers, crashed into cliffs and impeded public and private emergency services [21, 22]. Most recently – and potentially significantly for water quality along the proposed Mammoet Coeur d’Alene lakeside megaload route – ITD authorized application of 1000 gallons of de-icing fluid of unknown chemical composition, to assist the re-start and summit passage of an Omega Morgan shipment hindered for weeks by weather and permit complications on the Idaho side of Lost Trail Pass . Citizens concerned about the lax state oversight and myriad impacts of these overlegal loads, who have monitored, documented, and protested dangerous convoy practices and conditions, have additionally faced unwarranted targeting, surveillance, intimidation, harassment, and arrest by state troopers and county and city police sworn to serve public safety, but who instead protect corporate interests that challenge Idahoans’ civil liberties and risk the health and wellbeing of people, places, and the planet . To date, police have arrested 61 Rising Tide allied climate and tribal activists and cited four more during over one hundred direct protesting and monitoring confrontations of this corporate take-over of public highways. They and thousands of regional community members can attest that Mammoet’s operations are anything but safe, as private profit consistently usurps public interests. During one fiscal year, Imperial Oil transports cost the Idaho Transportation Department $645,000 in administrative costs not covered by megaload permits, not to mention the millions of dollars that American taxpayers spend to repair public transportation infrastructure damaged by tar sands shipments . ITD and Mammoet stated – and the engineering firm and bridge analysis consultants Forsgren Associates contacted our organizations to assure us – that the Montana Refining Company destination of these reactor vessels, a wholly-owned subsidiary of Calumet Specialty Products Partners, would use the three pieces of a hydro-cracker “to create ultra-low-sulfur diesel to meet EPA Clean Air [Act] standards,” and that these transports would carry “no hazardous waste or chemicals” . However, we have researched and widely publicized that these 1.6-million-pound megaloads would triple the conversion of 10,000 barrels per day of Canadian heavy tar sands crude into Rockies transportation fuels. This crude oil arrives via pipelines and rail cars as 95 percent of the feedstock of this closest U.S. refinery to Alberta tar sands mining operations . Such hydro-cracking and hydro-treating pressure vessels, which split heavy hydrocarbon molecules and insert hydrogen under high heat and pressure, are essential to tar sands refining and production of lighter, valuable hydrocarbons like diesel fuel . As new and upgraded tar sands refineries proliferate in greater proximity to Alberta tar sands mines, the Northwest region can expect and resist more of these megaloads and their anticipated significant impacts on air quality, both in transit and at their destinations. Raw Canadian bitumen (tar sands) characteristically contains large quantities of sulfur, released as more intense, under-regulated, toxic sulfur dioxide air pollution than from conventional oil refineries. Lower-income, minority, and disadvantaged populations living in ‘fence-line’ communities near these refineries disproportionately suffer the resulting, heightened health risks and impacts of increasing U.S. production of transportation fuels from bitumen blends. “According to the Environmental Protection Agency (EPA), short-term exposure to elevated sulfur dioxide levels is associated with reduced lung function, chest tightness, wheezing, shortness of breath, respiratory illness, deterioration of the lung’s defense systems, and the aggravation of cardiovascular systems” . Sulfur dioxide emissions aggravate conditions and diseases more common in refinery neighborhoods, such as asthma, cancer, and weakened heart and circulatory systems. With nitrogen oxide, sulfur dioxide and related particulate matter degrade visibility and primarily cause the acid rain that decays building and vehicle materials and paints, acidifies surface water and aquatic environments, and damages sensitive forest soils, high-elevation trees, and vast ecosystems . By accommodating installation and utilization of the proposed Mammoet megaloads at their Great Falls tar sands refinery destination, the project route, ramp construction, and shipment movements would significantly impact and intensify these human and environmental health conditions. Connecting Pacific-rim manufacturers to the North American interior, via the relatively cheap and easy Columbia and Snake River barge and lock transport systems reaching the farthest inland West Coast ports, federal highways across Idaho over the last three years have endured growing numbers, sources, and sizes of overlegal and oversize loads en route to Alberta mines or Montana refineries producing tar sands. Accordingly, these routes – and the critical link of the proposed Higgens Point on-ramp – enable and accelerate the significant impacts of Alberta tar sands mining and processing on public and environmental health and climate change. Considered the most expensive and destructive energy extraction project within the history and expanse of the Earth, exploitation of tar sands deposits inordinately poisons the irreplaceable air, water, and wildlife of First Nations lands and communities, exacerbates dangerously high atmospheric concentrations of carbon dioxide, greenhouse gases, and other pollutants amplifying climate change feedback loops, and prolongs the flawed politics and economics buttressing worldwide addiction to fossil fuels, while impeding international agreements and sustainable energy solutions that reduce global warming [30, 31]. 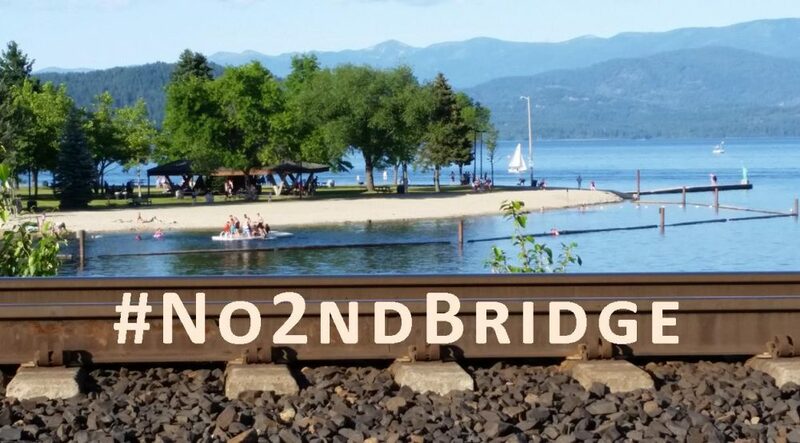 Consequently, the seemingly localized and transitory creation of this Coeur d’Alene Lake Drive Temporary Overweight Truck Route foreshadows ominous, cumulative impacts that demand urgent, prudent, and responsible agency actions. We the undersigned respectfully request that the Federal Highway Administration, Idaho Transportation Department, and other responsible agencies extend and expand their NEPA review and public involvement processes and periods, to fully investigate the broader impacts of the proposed Mammoet megaload ramp and route. Thus far, ITD information provision and opportunities for input regarding this project – both crucial to the public capacity for critical review and substantive comments – have been inadequate, incomplete, or purposely omitted. For instance, ITD held just one public open house about this project at the ITD District 1 office in Coeur d’Alene, Idaho, on December 19, 2013, and closed the public comment period ten days later on December 29, during the holidays and usual vacation times of concerned regional citizens. ITD and Mammoet offered documents outlining project plans and rudimentarily portraying the proposed on-ramp in a diagram only to public meeting participants, not online for the wider public. Despite formal public records requests by our organizations for all project documents on December 23, January 17, and over the last two months, the agency did not respond with some of this material that we belatedly obtained from other sources than ITD. Considering all of the herein described and other possible significant impacts of the Coeur d’Alene Lake Drive Temporary Overweight Truck Route on the environment, natural resources, public infrastructure, and associated health, social, and economic conditions, as well as mandatory ITD and FHWA compliance with NEPA for this project, are these responsible agencies consulting the U.S. Environmental Protection Agency and Fish and Wildlife Service, the U.S. departments of the Interior and Transportation, the Idaho departments of Environmental Quality and Fish and Game, and other pertinent agencies about temporary on-ramp and megaload route plans? We strongly recommend that the FHWA and ITD address the concerns and issues raised in these comments and that the appropriate cooperating agencies delay and/or deny project approval based on further review and analysis. Idaho Transportation Department. “Mammoet Megaloads 2013-14 Public Records.” Wild Idaho Rising Tide. January 10, 2014. Coeur d’Alene Press. “Legals December 13, 2013.” Coeur d’Alene Press. December 13, 2013. Elaine Williams. “Agency: New Turnouts Not Related to Oversized Loads.” The Lewiston Tribune. June 27, 2011. Idaho Transportation Department. “Megaload Ramp – ITD Public Meeting 12-19-13.” Wild Idaho Rising Tide. December 19, 2013. Scott Reed. “Here Comes a Megaload of Trouble.” Coeur d’Alene Press. December 20, 2013. Associated Press. “Boaters Save Bulldozer Operator.” The Bulletin. May 18, 1990. Idaho Transportation Department. “Megaload Route – ITD Public Meeting 12-19-13.” Wild Idaho Rising Tide. December 19, 2013. Rob Rogers. “Big-Rig Wreck Shuts down Highway, Requires Cranes for Clean-Up.” Billings Gazette. February 6, 2013. Betsy Russell. “Montana-Bound Megaloads Would Use Abandoned Higgens Point Interchange.” The Spokesman-Review. December 19, 2013. Idaho Transportation Department. “Scott Reed Comments.” Wild Idaho Rising Tide. December 19, 2013. Uglybridges. “I 90 EBL over Coeur d’Alene Lake; Blue Creek Bay.” Uglybridges: National Bridge Inventory Data. KRFP. “Moscow City Superload Meeting – Uncut Part 1.” KRFP. January 20, 2014. KRFP. “Moscow Superload Meeting – Uncut Part 2.” KRFP. January 21, 2014. Coeur d’Alene Tribe. “Lake Management.” Coeur d’Alene Tribe. February 1, 2014. U.S. Environmental Protection Agency. “Bunker Hill/Coeur d’Alene Basin Operable Unit 3.” U.S. Environmental Protection Agency. ‎August ‎9, ‎2011. Northwest Power and Conservation Council. “Coeur d’Alene Subbasin Overview.” Northwest Power and Conservation Council. Wild Idaho Rising Tide. “Highway 95 Megaload Accident.” Wild Idaho Rising Tide. Wild Idaho Rising Tide. “Moscow Megaload Collision.” Wild Idaho Rising Tide. George Prentice. “Mega-Load Snaps Power Line, Causing Outage Along U.S. 12.” Boise Weekly. April 12, 2011. Wild Idaho Rising Tide. “Highway 95 Damage South of Moscow 4-2-12.” Wild Idaho Rising Tide. April 2, 2012. KREM. “Megaloads Hit Mega Snag, Again.” KREM. February 4, 2011. Alex Sakariassen. “Megaloads: The Long Night.” Missoula Independent. November 10, 2011. Laura Zuckerman. “Mega Mess Left at North Fork.” Post Register. January 24, 2014. Wild Idaho Rising Tide. “Media Release: More Charges Brought Against Tar Sands ‘Megaload’ Protesters in Moscow, Idaho.” Wild Idaho Rising Tide. March 10, 2012. Bill Spence. “ITD Loses $645,000 Annually on Oversize Load Permits.” The Lewiston Tribune. January 24, 2012. Wild Idaho Rising Tide. “WIRT Newsletter: Wednesday Hearing/Action and Public Records/News about Tar Sands Refinery Megaloads.” Wild Idaho Rising Tide. January 14, 2014. Dave Cooper. “Really Heavy Loads Hit the Highways in Alberta.” Edmonton Journal. February 4, 2014. Aaron Sanger. “Tar Sands Refineries: Communities at Risk.” ForestEthics. September 2012. U.S. Environmental Protection Agency. “Sulfur Dioxide.” U.S. Environmental Protection Agency. January 8, 2014. Wild Idaho Rising Tide. “Megaload Facts.” Wild Idaho Rising Tide. Wild Idaho Rising Tide. “WIRT Comments to the City of Moscow on Highway 95 Megaloads.” Wild Idaho Rising Tide. June 16, 2011. Very well said, thanks for all you do! Thanks for putting this article together. I would like to present the information regarding the possible Mammoet route through the Flathead Reservation on Highway 200 to my friends at the Salish and Kootenai Tribal Council, but couldn’t see that while skimming through the article or your endnotes. I am pressed for time right now, or I’d give it a more thorough read, but could you please send me the material that specifically refers to those plans? Thank you.